An impressive edifice standing in the northern part of the city, since 1956, Casa Scanteii (as it is still universally known) was designed by architect Horia Maicu. The building is a smaller replica of the Lomonosov University in Moskow - Russia (inaugurated in 1953). Between 1956 and 1989, the House of the Free Press housed almost all of Romania's capital printing presses and headquarters of print media companies. 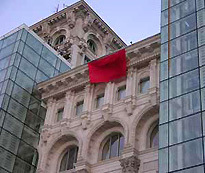 Today, Casa Presei Libere carries out much the same function but the southern wing is now the home of the Bucharest Stock Exchange. Initially built of wood in 1878 to honor the Romanian soldiers who won the Independence War, Bucharest's Arch of Triumph was rebuit in 1922 and redecoreted in 1936 with base reliefs carved in granite brought from Deva (Transylvania). Designed by the architect, Petre Antonescu, the Arch stands 89 feet high. The sculptures decorating the structure were created by leading Romanian artists, including Ion Jalea, Constantin Medrea and Constantin Baraschi. Calea Victoriei is Bucharest's oldest and arguably, most charming street. Designed in 1692 to connect the Old Princely Court to Mogosoaia Palace, the street (initially named Podul Mogoșoaiei) was originally paved with oak beams. The street became Calea Victoriei in 1878, after the Romanian War of Independence victory. Between the two world wars, Calea Victoriei developed into one of the most fashionable streets in the city. 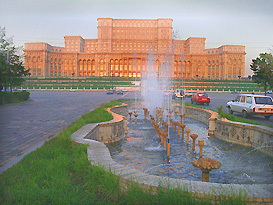 National Savings Bank Palace and the National History Museum. Grigore Cantacuzino was thought to be one of Romania's wealthiest citizens in 1899. 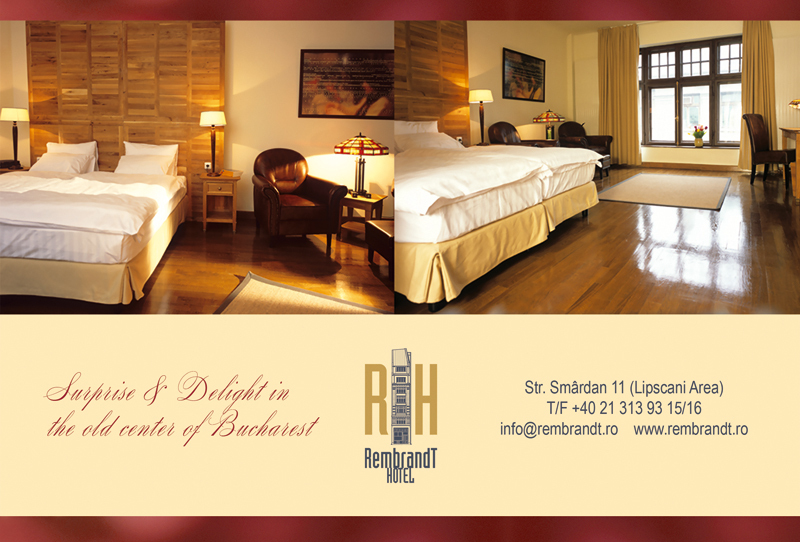 As Prime Minister, it was his wish to have the most elegant residence in Bucharest. Using the designs of architect Ion Berindei, the Cantacuzino Palace was built between 1898 and 1900 in eclectic French style. Combining a neoclassical architectural style with art nouveau elements, it features wrought iron balconies, tall arched windows and a porte-cochere (an elegant wrought-iron doorway) flanked by two lions. 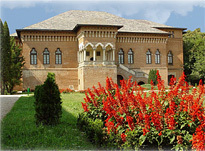 Today, the palace houses the George Enescu Museum (more information). Erected between 1927 and 1937 in neoclassical style, the palace was home to King Carol II and to his son, King Mihai I, until 1947, when the monarchy was abolished in Romania. It was inside the halls of this palace that King Mihai, aged 18, led a coup that displaced the pro-Nazi government during the World War II and put Romania on the Allies' side. Today, the former Royal palace houses the Romanian National Art Museum (more information). The lobby has a beautifully painted ceiling decorated in gold leaf, while curved balconies cascade in ringlets off a spiral staircase.A ring of pink marble columns is linked by flowing arches where elaborate brass lanterns hang like gems from a necklace. Inside the concert hall, voluptuous frescoes cover the ceiling and walls. Renowned worldwide for its outstanding acoustics, it is Bucharest's most prestigious concert hall and home of the Romanian George Enescu Philharmonic. Standing guard imposingly, this neoclassical masterpiece, designed by Romanian architect Dimitrie Maimaroiu, was built in 1912 to serve the social, cultural and educational needs of the Romanian army. Banquets and official events are still hosted in the ballrooms, while the upstairs area is reserved for the army's library, as well as offices and classrooms for officer instruction. The main part of the building is off-limits to civilians, but the sumptuous restaurant and summer terrace is open to the public. At the beginning of 1400s, most merchants and craftsmen - Romanian, Austrian, Greek, Armenian and Jewish - established their stores and shops in this section of the city; a jumble of streets between Calea Victoriei, Blvd. Bratianu, Blvd. Regina Elisabeta and the Dambovita River. Soon, the area became known as Lipscani, named for the many German traders from Lipsca or Leiptzig. Other streets took on the names of various old craft communities and guilds, such as Blanari (furriers), Covaci (blacksmiths), Gabroveni (knife makers) and Cavafii Vechii (shoe-makers). The mix of nationalities and cultures is reflected in the mishmash of architectural styles, from baroque to neoclassical to art nouveau. Today, the area is home to art galleries, antique shops, coffeehouses, restaurants and night-clubs. While walking in the narrow cobblestone streets one can imagine the long-gone shopkeepers outside near their stores, inviting bypassers to buy their merchandise. 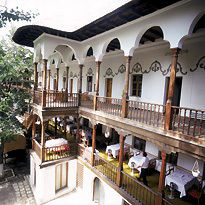 Built in 1804 by the wealthy Armenian trader Emanuel Marzaian (called by the Turks "Manuc Bey"), the inn has the preliminary talks concerning the Peace Treaty that put an end to the Russian -Turkish War (1806-1812). A favorite meeting place for tradesmen, Manuc's Inn has preserved to this day its character and flavor. A restaurant, wine cellar and a pastry shop are now welcoming guests from all over the world. The Beer Wagon restaurant and beer house became, soon after the opening in 1879, one of the most popular meeting places for Bucharest's literati who would gather to discuss matters of their time. Its neo-gothic architectural style is reflected both in the façades and the interior decorations: columns, arches, chandeliers, a wooden staircase, furniture and murals on the walls and ceiling. The National Bank of Romania (BNR) stands on the site of one of the most famous buildings in Romania: the Hanul Serban Voda, which from 1678 until 1883 was the home of various institutions ranging from a pub to an inn to a girl's dormitory! After two fires gutted the building, however, the land was leveled and in 1883, work began on the BNR, completed to the designs of French architects Cassien Bernard and Albert Galleron in 1885. Built in neoclassical French style, the building boasts a facade with Corinthian columns and an enormous central banking hall. The passing of time has left its marks on the building, but it remains a classic worthy of admiration. Buzzing with crowds and traffic from early morning until late at night, this area is one of the most popular meeting places in Bucharest. The square brings together some remarkable architectural masterpieces on each of its four corners, starting with the University of Bucharest's School of Architecture, the Bucharest National Theatre, the neoclassical Coltea Hospital and its lovely church (1702-1794) and the Sutu Palace, now home to the Bucharest History Museum. The oldest hospital in Bucharest, dating from 1704, Coltea was built on land belonging to the Vacaresti family, who at the time owned many of the great prosperities of the capital. The original building was destroyed by an earthquake in 1802, and the neoclassical building standing today dates from 1888. The church next to the hospital is the original 1701 construction, and is currently undergoing much-needed renovation. The hospital remains a functioning public health centre; you may enter only if you have official business. The church, however, is open to all, and the saintly silhouettes on the ceiling are admirable. Famous for the grandiose balls held here in the 1900s, Sutu Palace was built in neogothic style between 1832 and 1834 by foreign minister Costache Sutu, to designs of architects Johann Veit and Konrad Schwinck. In 1862, the palace was redecorated by sculptor Karl Storck, who created three arcades and a monumental stairway; a huge Murano mirror was added in the hallway. Only the painted ceilings, the stucco, the parquet flooring and the tile stoves have been preserved. 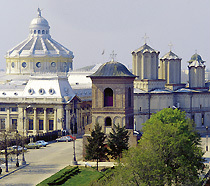 Since 1959, the building has housed the Bucharest History & Art Museum (see details). Open to visitors: Mon. - Sun. after the U. S. Pentagon. a 350-ft.-long lobby and eight underground levels, including an enormous nuclear bunker. The crystal chandelier in the Human Rights Hall (Sala Drepturilor Omului) weighs 2.5 tons. Some of the chandeliers have as many as 7,000 light bulbs. When construction started on June 25, 1984, the building was intended it to be the headquarters of the country's Communist government. Today, it houses Romania's Parliament, Bucharest International Conference Centre and Romnaia's Museum of Modern Art. Built, furnished and decorated exclusively with materials sourced and made in Romania, the building reflects the work of the country's best artisans. Valid passport or national Identity Dard is required to gain access to the Palace of Parliament. Large groups: reservations are strongly recommended. - type of tour desired (standard, standard + terrace or standard + terrace + the underground). king Carol II of Romania had planned to build Romania’s House of Representatives (Camera Deputatilor). The Palace of the Romanian Parliament is the world's Heaviest Building! four restaurants, three libraries, two underground parking and one concert hall. With only three exceptions, all the materials used to build the palace have been produced or made in Romania. -- ventilation pumps with special filters, imported from Sweden. Nicolae Ceausescu's building megalomania is perhaps best illustrated by with the construction of the Civic Centre, an area located at the south end of the Palace of Parliament along Bulevardul Unirii. The redevelopment of the area was supervised by Romania's Communist leader himself. More than three square miles ( eight square km. or 2,000 acres) of buildings in the old section of the city (including private residences, shops, two churches, a hospital and a noted Art Deco sports stadium) were leveled to make room for the construction of Stalinist apartment buildings topped with neoclassical follies. One of the oldest churches in Bucharest (with parts dating back to the 16th century and a steeple built in 1715), the Apostles' Church is brimming with some rather strange portraits that are well worth seeing. Set atop one of the city's few hills, known as Mitropoliei, the Metropolitan Church has been the centerpiece of the Romanian Orthodox faith since the 17th century. The church was built by Constantin Serban Basarab, ruler of the province of Walachia between 1656 and 1658, to a design inspired by the Curtea de Arges monastery. It became the Metropolitan Church in 1668 and the seat of the Romanian Orthodox Church in 1925. The Byzantine interior, containing the most dazzling of the city's iconostasis, as well as a couple of exquisitely carved side altars, bestows great beauty on the services presided over by the Romanian Patriarch. A huge crowd gathers here for the Easter midnight service. The outstanding bell-tower at the entrance was built in 1698 and restored in 1958. Next to the church, and closed to the public, is the Patriarchal Palace (1708), residence of the Teoctist, supreme leader of the Romanian Orthodox Church. At the beginning of the 20th century, the Jewish population in Bucharest numbered 40,000 people with 70 temples and synagogues. From this great number, only a few survived the brutality of history - fascism and communism - and two still serve the city's present Jewish community. 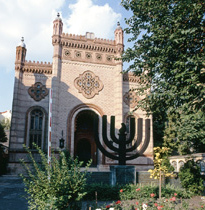 Housed in the magnificently preserved Great Synagogue (1850) in the city's historically Jewish neighborhood, this museum traces the history of Romania's Jewish population. The displays include a collection of books written, published, illustrated or translated by Romanian Jews; a small collection of paintings of and by Romanian Jews (many of the same artists' works hang in the National Museum of Art) and memorabilia from Jewish theatres including the State Jewish Theatre. The museum also contains a large collection of Jewish ritual objects from Romania, collected by Rabbi Moses Rosen (1912-1994), the late Chief Rabbi of the Romanian Jewry. Built in 1857, the red brick temple (noted for its magnificent Moorish turrets, choir loft and organ) is the largest active synagogue in Bucharest. Open: Wed. - Sun. 10 a.m. - 6 p.m.; Closed Mon. & Tue. A small, but fascinating, room is home to an interesting collection of communist-era bust sculptures (including that of Lenin), paintings and memorabilia. Open: Tue. - Sun. 9 am - 5 pm; Closed Mon. Note: Visits by appointment only; please call for reservations. After 1990, the old wing of the palace became a museum. The Oriental Hall, the Norwegian Hall and the Queen's Chamber are almost unchanged from the original design and are worth visiting. Very important collection of medieval art also can be seen here. The new wing serves as the seat of the Romanian Presidency. Open: Tue. - Sun. 10:00am - 5:00pm; Closed Mon. Open: Tue - Sun 1 am - 8 pm (last admission 7 pm). Closed on Mondays. Open: Tue. - Sun. 10 am - 6 pm; Closed Mon. Wed. - Sun. 10 a.m. – 6 p.m. (October - April); Closed Mon. & Tue. Romania's leading art museum was founded in 1948 to house the former Royal Collection, which included Romanian and European art dating from the 15th to the 20th century. Located in the neoclassical former Royal Palace, set amid a wealth of historic buildings such as the Romanian Athenaeum, Kretzulescu Church and the Hotel Athenee Palace-Hilton, the museum currently exhibits over 100,000 works divided into two major sections. Its National Gallery features the works of major Romanian artists, including Grigorescu, Aman and Andreescu. There is also a roomful of early Brancusi sculpture, such as you won't find anywhere else, demonstrating how he left his master, Rodin, behind in a more advanced form of expression. The European Gallery, comprising some 15 rooms, displays little-known art gems from the likes of El Greco, Monet, Rembrandt, Renoir, Breughels (father and son) Cezanne and Rubens. If you only have time to visit one gallery, make it the Romanian one. It is the most complete collection of Romanian works of art in the country and quite possibly, the world. including a well-presented geological structure of Romania's territory. Open: Wed. - Sun. 10 am - 6 pm; Closed Mon. & Tue. This museum is worth a visit, especially if you are interested in old maps and books. For a quarter of a century (1965 - 1989) the “Spring Mansion” served as the private residence of Nicolae and Elena Ceauşescu and their three children, Nicu, Zoia, and Valentin. A variety of woods, both native (oak, sycamore, cherry, walnut) and exotic (mahogany, rosewood, African pear, Canadian cherry), have been used for building and decorations. The residence is home to an impressive collection of paintings ( by Octav Băncilă, Camil Ressu, Rudolf Cumpăna, Dumitru Ghiață, George Baron Lowendal ), handmade tapestries and mosaics designed by Romanian artists Olga Porumbaru and Florin Pârvulescu. Access: Nord Train Terminal (Gara de Nord), track # 14.
railways memorabilia including pictures and Romanian Railways uniforms. Several passenger train wagons and engines are on display in the open-air section of the museum. Open: Tue. - Sun. 9 am - 4 pm; Closed Mon. built in 1913 by a French architect after the plans of Frederick Storck. as well as antique cars and motorcycles. as well as numerous other art objects. Tue. - Sun. 9 a.m. - 7 p.m. 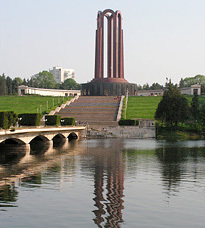 Founded by royal decree in 1936, this fascinating outdoor museum, the largest in Europe, covers some 30 acres on the shores of Lake Herastrau in Herestrau Park. It features a collection of 50 buildings representing the history and design of Romania's rural architecture. 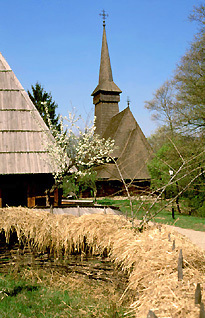 Steep-roofed peasant homes, thatched barns, log cabins, churches and watermills from all regions of the country were carefully taken apart, shipped to the museum and rebuilt in order to recreate the village setting. Throughout the year, the Village Museum hosts special events where you will have a chance to witness folk artisans demonstrating traditional skills in weaving, pottery and other crafts. Folk arts and crafts are available at the museum gift shop. The museum exhibits the private art collection of art critic and collector Krikor Zambaccian (1889-1962). Works of Romanian painters: Ion Andreescu, Nicolae Grigorescu, Stefan Luchian, Theodor Pallady and Nicolae Tonitza, who have been inspired by the Impressionists, can be admired at the Zambacian Museum. Although Zambaccian was a big patron of the art of his home country, during his studies in Belgium and France (1907 - 1913) he purchased numerous European works from artists such as Cezanne, Renoir, Delacroix, Corot, Derain, Matisse, Pissaro, Bonnard, Utrillo and Picasso. The museum preserves the initial display as it was conceived by the art collector himself. There are also several beautiful small sculptures that complement the canvases. Romania’s equivalent of Ripley's Believe It or Not is a place for fun and entertainment and a bad weather ‘refuge’ for locals and visitors. The huge greenhouses are open Tue, Thu, Sat, Sun, 9am - 1pm. Designed by French landscape architect Eduard Redont in 1900s, the park offers pleasant walks down tree-lined paths, a good view of central Bucharest (from the monument) and plenty of photo opportunities. In summertime, the park's Arenele Romane is the stage for open-air concerts. This is where Bucharest's elite once lived - and still do today. and get familiar with the city's central neighborhoods and places of interest, in less than one hour. Bucharest hop on/ off tours are suspended during the cold weather months (late-fall until late-spring). Hours of operation: 10 a.m. - 9:50 p.m.
Last departure from Piata Unirii to Piata Presei Libere at 9:25 p.m.
and are valid for 24 hours from the time of validation. including the massive Palace of Parliament and the House of the Free Press. Your local guide will also take you to back streets and will offer information about little-known areas of the city. next to General Charles de Gaulle statue. Staff wears a distinctive green outfit. Duration: three hours and 30 minutes(including one snack break). (includes: Bike, guide, snack and bottle of water). (including Palace of Parliament, Stavropoleos Church, Manuc's Inn, the Old Town, Bucharest University), and the city's fascinating mix of architectural styles. April - September: every day at 10:30 a.m. and 6 p.m.
October - March: every day at 10 a.m. and 3 p.m.
Tour starts: from Parcul Unirii (Union Plaza Park). pointing out several unique sights. Stray from the routes as you wish, as you're sure to find other interesting places along the way that are not mentioned here. Allow approximately three hours for each walk. Located in the village of the same name on the shore of Mogosoaia Lake, this palace reflects the Brancovenesc architectural style, featuring traditional Romanian staircase balconies, arcades and columns. Built by the Walachian prince Constantin Brancoveanu between 1698 and 1702 as a summer residence, the palace features a beautiful Venetian-style loggia on the facade facing the lake and a balcony with intricate Brancovenesc-style carvings overlooking the main courtyard. Today, the palace houses the Brancovenesc Museum with exhibits of valuable paintings, wood and stone sculptures, gold and silver embroideries, rare books and precious manuscripts. Inside the complex, there is also a church built in 1688 and decorated by a team of Greek artists. The original interior murals have been well-preserved, including a painting showing Constantin Brancoveanu with his wife, Maria, and their four sons and seven daughters, all wearing royal dress. Bucharest is a great starting point from which to explore the rest of the country. Away from the buzz of the city, you will find a different side of Romania - life in the countryside moves more slowly, the air is crisp and hospitality abounds. Poenari - Bucharest: 112 miles. 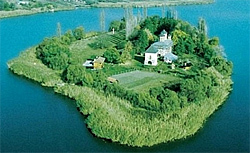 In Targoviste, tour the 14th century Princely Court (Curtea Domneasca) and Chindiei Watchtower (Turnul Chindiei). The grounds are open Tuesday through Sunday from 9 a.m. to 5 p.m.
From Targoviste, continue to Curtea de Arges. Once you reach Curtea de Arges, visit the 14th-century Princely Court and the 800 years old Princely Church, . Curtea de Arges was founded in the late 1200s by Prince Radu Negru (or Negru Voda). Between years 1369 and 1431 Curtea de Arges was the capital of Wallachia, the southern part of Romania. Curtea de Arges Monastery (Manastirea Curtea de Arges). Romania's kings and queens are buried here. Acording to the legend, the master builder, Manole, had to sacrifice his wife by imprisoning/ placing her alive into the southern wall of the monastery in order to prevent the structure from falling apart. the authentic stronghold of voivode Vlad Tepes (the Impaler) or Vlad Dracul. just off the Transfagarasan highway over the Fagaras Mountains (Transylvanian Alps). Access to fortress, perched on a cliff - high above the surrounding area, requires climbing of a 1,462-step stairway. Fifty miles west of Curtea de Arges stands Horezu Monastery, the largest monastic settlement in Walachia, founded in 1690 by Prince Constantine Brancoveanu. A masterpiece of the Brancovenesti style and a UNESCO World Heritage site, Horezu is renowned for the richness of its sculptural detail, the treatment of its religious compositions and its painted decorative works. The monastery houses precious collections of frescoes and icons dating from the end of the 17th century and the beginning of the 18th century. The nearby village of Horezu is home to one of the biggest pottery centres in Romania. Nearly a century ago, local nuns taught the villagers how to make and paint pottery, and ever since, people have come from far and wide to get their hands on Horezu's ceramic. A must for all art lovers is a visit to Targu Jiu on the banks of the River Jiu. This former market town is closely associated with Constantin Brancusi, considered by many to be the father of modern sculpture. While most of his works are on display in prestigious museums throughout the world, his trilogy of public sculptures, The Table of Silence (Masa Tacerii), The Gate of the Kiss (Poarta Sarutului) and The Endless Column (Coloana Infinitului) can be admired at the Constantin Brancusi sculptural complex in downtown Targu Jiu. Nearby in Hobita, the birthplace of Constantin Brancusi, you can visit the house in which the sculptor spent his childhood; it now houses a small museum dedicated to the master. The house preserves the original architecture and accessories (the bed, the cellar and the well). The village is also home to the national sculpture camp "Brancusiana". Bucharest has numeros drama theatre and concert venues. Tickets can be purchased on-line or directly at the venue's box office. Box office hours: Mon. - Sun. 10 a.m. - 1 p.m.; 2 p.m. - 7 p.m. 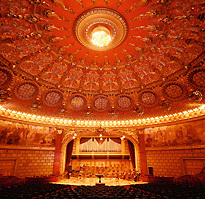 The Romanian Athenaeum is the main venue of the biennial classical music festival "George Enescu"
Famous artists and conductors have performed here throughout the years. Among them: Erich Kleiber, Sergiu Celibidache, Ionel Perlea, Herbert von Karajan, Dinu Lipatti, Arthur Rubinstein, Pablo Casals and Yehudi Menuhin. The National Radio Orchestra, one of the best in the country, presents frequent classical chamber music performances at the music hall in the radio building. Theatre performances are very popular in Romania and for most shows tickets sell-out within hours. While most theatre productions are performed in Romanian, sometimes, it is possible to find performances in German or English at various small theatres. There are 16 major theatres in Bucharest offering performances for all ages. The theatre season closes during the summer, from July to September, although some small student and underground theatres do remain open. Three auditoriums host professional domestic and foreign plays by a broad selection of both classical and contemporary Romanian playwrights. The theatre's Great Hall (Sala Mare), hosts the grand productions, while the Amphitheatre (Sala Amfiteatru) shows smaller productions and TV shows, and the Studio Hall (Sala Atelier) gets a mix of lower-key shows and presentations. The Jewish Theatre offers performances in Yiddish, Hebrew and Romanian (translation into Yiddish and Hebrew available). Open: Tue. - Sun. 1:00pm - 3:00am; Closed Mon. Located nearby the National Theatre, this bar is filled with university students, artists, musicians and young professionals. Usually crowded, the bar (called Laptaria lui Enache) is open all year long, while its rooftop counterpart (called La Motor) is open only during the summer when movies are shown on the terrace. At Laptaria, you can catch live music most evenings. Built in 1960, the enormous, permanent big-top circus is the centerpiece of a small but lovely park. With seating for more than 3,500 spectators, Bucharest's circus continues to host excellent performances, put on by both local and touring companies. 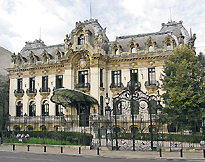 In recent years, several casinos have opened up in Bucharest, one of the few cities in east-central Europe offering gambling opportunities.br /> Many 18th and 19th century palaces and mansions now house elegant beaux-arts casinos, where guests can play blackjack, poker, craps, roulette, baccarat and other games of chance, dine on sumptuous buffets and dance all night to live music. bus (autobuz), tram (tramvai), trolley bus (troilebuz) and subway (Metrou). Buses, trams and trolley buses operate - between 5 am and 11:59pm. The subway operates - from 5 am until 11 pm. Tickets/cards must be purchased beforehand and validated upon boarding. Travelers may be asked to show the validated ticket/card during the trip. Travelers without a validated ticket must pay a 50 Lei ($12.00) penalty (Suprataxa). Tickets or passes can be purchased at any kiosk displaying the RATB logo. Tickets are interchangeable for the bus, tram and trolley bus, with the exception of express buses. connect Bucharest International Airport with the downtown and respectively with the city's main train terminal. Bus 780 from / to the airport to the train station operates from 5:19 am to 11:04 pm. Two or 10-journey tickets, as well as monthly passes, are available for express buses. RATB maps can be found at kiosks near bus and tram stops or you can print one here. subway operates - from 5 am to 11 pm. There are four subway (Metrou) lines (M1, M2, M3 and M4). Subway stations are indicated with the letter "M" (blue, on a white board). Metro maps can be printed here or can be purchased in bookshops and newspaper kiosks. The final destination is indicated on the front of the train. Each stop is announced as the train nears the station. Trains arrive every four to seven minutes during peak times and every 15-20 minutes off-peak times. The average distance between subway stops is about one mile. Most international flights arrive at Henri Coanda (Otopeni) Airport. Airport facilities include ATM, currency exchange office, Taxi Desk and cell phone rentals. Major car rental companies have offices located on the arrivals/ baggage claim level. There are non-stop flights to Bucharest from most major European cities and in the Middle-East and connecting flights from the United States, Canada, Australia and New Zealand. Sibiu (SBZ), Suceava (SCV), Timisoara (TSR) also depart from/ arrive to Henri Coanda Airport. 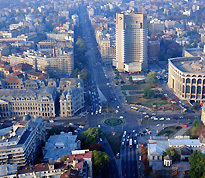 Distance from Bucharest airport to downtown: 18 km (11 miles). Several Taxi companies operate in Bucharest, and their rates can vary. Taxis can be called by using the touch screen computer (Dispecerat Automatizat Taxi) available next to the Taxi Desk (Taxi la Comanda) located in the arrivals terminal. There is no flat rate taxi transportation available from Bucharest Airport to downtown. Rate / km: 1.39 lei to 3.50 lei. There is no extra-charge for luggage. The average fare from the airport to downton Bucharest is less than 70 Lei (the equivalent of $18.00). you will risk to be overcharged. Fare estimates offered by TarifTaxi.ro are for the shortest route/ normal traffic conditions. met a dishonest driver - ask for a receipt and if possible try to write down the vehicle's license plate #. 021 9551 (Consumer Protection Authority). Express Bus 783 offers daily service to the city centre, with stops at Baneasa Airport, Piata Presei Libere, Piata Victoriei, Piata Romana, Piata Universitatii and Piata Unirii. (every 40 minutes between 10 p.m. and 6 a.m.). 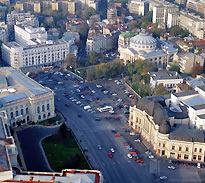 The journey to Bucharest downtown takes approximately 40 minutes. available from at the 'RATB' ticket booth in the arrivals terminal or next to the bus stop. The bus ticket booth is open daily from 6 a.m. to 8:30 p.m.). One 'Activ Card' costs 3.70 Lei (about $0.85). To ride the bus you will also need to add value to your card (add 7 Lei for two trips from / to the airport or 3.50 Lei for one trip). Your Activ card must be validated as you board the bus. - Clabucet - Gara de Nord - Str. Fluviului. 5:25 a.m. to 11 p.m. during weekends. A roundtrip ticket costs 7.00 Lei (about $1.85). Henri Coanda Express Trains offer daily service from Balotesti (0.5 miles from the airport) to the main train station (Gara de Nord) with one stop at Mogosoaia. Trains run hourly from 5:56 a.m. to 9 p.m.; the journey from the airport to the train station takes about one hour and 10 minutes. One-way ticket costs 6 Lei ($1.50). Transfer from Balotesti train station to the International Arrivals Terminal is included. Note: Tickets can be purchased at the CFR booth International Arrivals Terminal. Baneasa Airport, located six miles from downtown Bucharest, is mostly used for private planes. Bucharest's main train terminal, Gara de Nord, is located three miles northwest of Bucharest downtown. The original Orient Express ran from Paris to Istanbul with several stops in Romania. There are daily trains from/to Athens, Belgrade, Budapest, Istanbul, Kiev, Moscow, Prague, Sofia, and Vienna. Trains from/to Western European cities run via Budapest. To check schedules and fares for domestic trains please check our Romania Transportation section. Note: For Bucharest please select Bucuresti Nord. The SNCFR ticket offices offer train schedules information and ce tickets for future travel. Several taxi companies operate in the city. Taxis can be summoned by telephone or hailed on the street. Fares per km are posted on driver's and passenger's doors. Check the taxi fares and ask the driver to confirm the approximate cost of the ride, if not sure. Please note that some taxi companies may post and/or charge up to five times the fares indicated above. If you run into a problem with any taxi in Bucharest – or if you are suspecting that you have met a dishonest driver - ask for a receipt and if possible try to write down the vehicle's license plate #. and/or 021 201 3242 (Transportation Bureau of the Police Department). Contact us if you need a list of all car rental companies in Bucharest. Since the 1990s, brand names and high-end stores have been pushing their way into the Romanian market. From high fashion boutiques to art galleries, shopping in Bucharest can fit any taste or budget. Stroll down Blvd. Magheru from Piata Romana to Piata Universitatii for a shopping extravaganza or hit one of the many shopping malls favored by the local rich & famous. the Village Museum, most department stores. Open: Mon. – Sun. 10 a.m. – 10 p.m.
Open: Mon. - Fri. 10 am - 6 pm; Sat. 10 am - 2 pm; Closed Sun. Open: Mon. - Sat. 11 am - 7 pm; Closed Sun. Open: Mon. - Fri. 10 am - 8 pm, Sat. 10 am - 6 pm; Closed Sun. Open: Wed. - Sun. 11 am - 7 pm; Closed Mon. & Tue. Open: Mon. - Fri. 10 am - 7 pm; Sat. 10 am - 2 pm; Closed Sun. If it is antiques that you fancy, Bucharest provides plenty of opportunities to fulfill your every whim. Antiques can be found in art galleries along Calea Victoriei and around the Old Historical Center (Lipscani street). Open: Mon. - Fri. 10:00am - 6:00pm; Closed Sat. & Sun. Open: Mon. - Fri. 10:00am - 6:00pm; Sat. 10:00am - 3:00pm; Closed Sun. Open: Mon. - Fri. 9:00am - 6:00pm; Sat. 9:00am - 3:00pm; Closed Sun. Open: Mon. - Fri. 10:30am - 6:30pm; Sat. 11:00am - 3:30pm; Closed Sun. Open: Mon. - Fri. 10:00m - 6:00pm; Sat. 10:00am - 3:30pm; Closed Sun. Open: Mon. - Fri. 10:30am - 7:30pm; Sat. 10:30am - 2:30pm; Closed Sun. Visitors interested in Romanian music can find recordings of pop artists and bands, such as Loredana Groza and Morandi, pan flute artist Gheorghe Zamfir and popular folk singers such as Maria Tanase. Open: Mon. - Fri. 9:30am - 7:00pm; Sat. 9:30am - 2:30pm; Closed Sun. This is the city's most centrally located outdoor market. The outdoor market is surrounded by butcheries, cheese, flower and medicinal plant shops. Resembling an Oriental bazaar, this is the place to find everything from fresh cheese and eggs, fruits and vegetables, to flowers and household items. Bucharest's biggest outdoor market; here, you can find here a huge food market and a "bazaar". Bucharest is safe and hospitable ; violent crime is almost non-existent. Do not draw unnecessary attention to your person, money or jewelry and be aware of pickpockets and scam artists. Never accept taxi/ car rides, tours or guide services from strangers, no matter how presentable or fluent in English, who approach you on the street. Bucharest has a four-season climate. In the spring, the weather can quickly alternate between rain and sunshine. June, July and August are the hottest months. As the leaves begin to change color, you can still enjoy warm and sunny days while taking a stroll in the city's many parks or down Calea Victoriei. Winters can be quite cold with moderate snowfall. Open: Mon. - Fri. 7:30am - 8 pm; Sat. 8 am - 2 pm; Closed Sun. and pharmacists are authorized to recommend medication for most (minor) ailments. There are several pharmacies (Farmacie) open 24 hours a day.